I was thinking things were getting a bit to quiet. The week was ticking over me getting more and more tired. Hayfever still an issue and fine when it rains but as soon as the rain stops I can feel my eyelids puffing up. I feel rather unattractive because of things like this. Last night I cooked dinner as usual. It tasted fine and Scott was fine so I cant tell if it was that. Then at 3am I woke up feeling queasy and unable to avoid the feeling. I was mighty sick and had to then sleep in the spare room so I did not wake scotty whilst suffering from the after gulps. So I took that day off I’ve been needing. I’ve sat on the sofa all day. I’ve achieved NOTHING and even napped. I’ve allowed myself to be as lazy as I need to be to feel better again. I’m mostly there but the one thing I forget is that when you puke it does several things like wrenches muscles and makes everything ache. I just wish I had more positive things to write. Its been nice spending the day around the cats, I have nothing major to complain about but with wedding plans stalled waiting for the end of June before it all starts to kick off I feel a little lost in no mans land and it makes me feel like I’m a bit too boring to blog about. This scarf is coming along nicely although slowly on 3mm needles. So far I’ve not spotted a single mistake. I’m very proud of that. 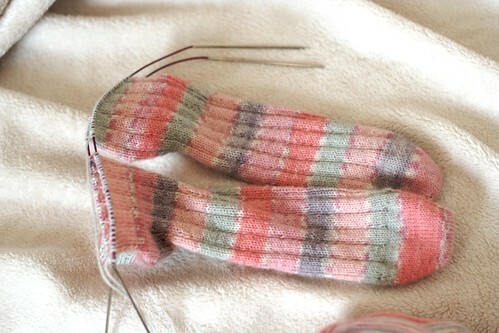 These socks are now off the needles and waiting for me to weave in the ends. and I’ve started a shawl in Colinette Tao. I now have 6 hanks of 50g a total of over 700yards. 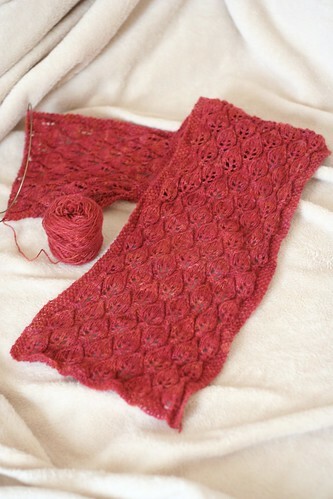 Plus its nearly DK in size on 5mm needles will make a HUGE and cuddly lace shawl. I’m working on a make it up as I go along. When do I ever do anything else. The basic start is filched from Victorian Lace today Spider shawl. I’ve shopped and cleaned a little, made more bread and generally relaxed. Scotty and I went for another walk around whitlingham lane and tried to find some of the more out of the way bits that are less known. Oh and our cats are most fun. Still very playful although having a dire bout of the farts. They mew so cutely and beckon you close then let a silent deadly one rip. I defy you to find a more offensive bodily odour. Otis has been on hand, or paw supplying tissue. 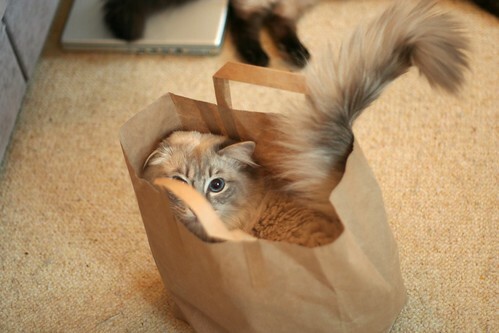 And Jasper has been attempting to fit in to a small paper bag. he’s not that small, now nicknamed STURDY because of his girth. Well nowt much has happened here. I hardly left the house all weekend. I did try and start a new knitting project but the love was just not there. Most frustrating. The shopping was done big style including a new Iron, in PINK because I just knew how much I would love seeing Scotty iron with a pink iron when he’s doing his shirts for work. Its the small things that make me happy. I also cleaned and tidied and hoovered the entire house starting at the top and working down. Well, I hoovered completely, I did not clean completely. Which reminds me I do love our little dyson Animal, its great on the stairs and really does pick up all the animal fluff and even my hair without clogging. Thats because it has not rotating brushes. I can break any hoover with rotating brushes because my hair is that strong. Aaaaaanyway, less of the babble and on to the reason and title of this blog post. I’ve been thinking a lot about the type of music I would like at my wedding. I know scotty and I have a whole heap of stuff that will do just fine for the evening disco bop. Which also means we can put an all out ban on any Celine Dion, Madonna, Kyle, Michael Jackson, Wham and all that sort of stuff you get from a general wedding DJ. Luckily our music provision is from a friend and for a mear £200 he is covered and insured with all his equipment. All we have to do is supply a 4Gb memory stick and or any other media and he can play all our choons YAY excessive cheese banned! The most important moments of the day are surrounded by some music. I would like those items to be particularly speical and to narrate me and Scotty as best they can. They have to be fully suitable for the occasion and suitable for the ears of the very young and very old. I do love a bit of classical but I am yet to find just the right thing, the right vibe and the positive sounds I want on my big day. The main segways of music I need to find are: my entrance (and before with background), signing time, us leaving the room, more fill music and the very essential first dance. Lets just remind you I dance one of two ways, like an idiot gurning at a rave or like my mum. Scotty is about the same but like his dad…. I can see this taking a long while to sort out and maybe even a couple of lessons. What I have been doing is gathering free tunes. I do love a good bargain and if people are willing to put their stuff out for free I’m willing to give them a shout out and say how good I think it is. In this case I’m listing some lovely lovely choons that make me smile. I’ll try and make links available to all where possible but I found most of these via ilike on Facebook and it looks like the easiest way to get hold of these songs for yourselves. Dreamland by Cordafonia I love the start of this track. Just plinky plonky enough and with all the promise of a beautiful sunny day. Then someone starts singing with a vocoder. BOO! still its very lovely and I’d love to find something else that cordafonia have done but they have not started up their web page yet. Swin I like both Murder Migration and Goodness Gracious. Both free for download. A.M. I like Othello interlude, its got a big beat but you cant beat a good indian flute. There are a couple of other tracks he has given away free which are very nice too but not for a wedding. they are “this is me dancing” Dr Cohen gets even and GrammarBack which is a great giggle for all you spelling and grammar purists out there. monkeybacon best viewed with firefox or safari. They have a couple of tracks on their site but on ilike they have lots of free tracks. All of the tracks are great and I love thier style and sound. They seem somewhere between quantic and mr scruff. Although I think Cabin and Cocktails is my fave for now. transocianic Both tunes that this band have produced are great fillers for signing the regester and things like that. Nice to have on in the background. Do you know of any good tunes to add to my list? I’d like to stipulate free, because they are going to be at my wedding and I don’t want to be done for playing music I’m not entitled to! I think its a cormorant, not a pant or ant or plant. 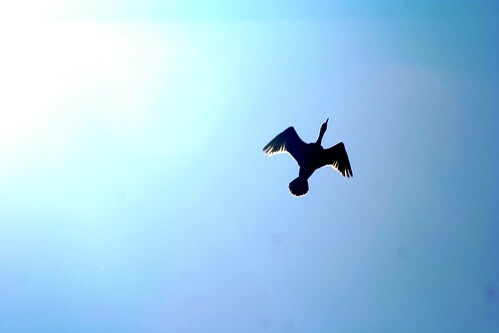 In flight at such hight, soaring through skies of blue. 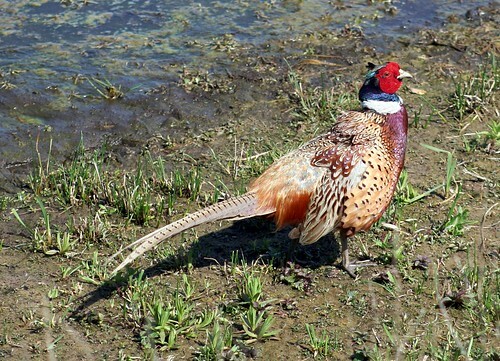 I know what this is… He’s a mighty pleasant pheasant, not a peasant but omipresent. 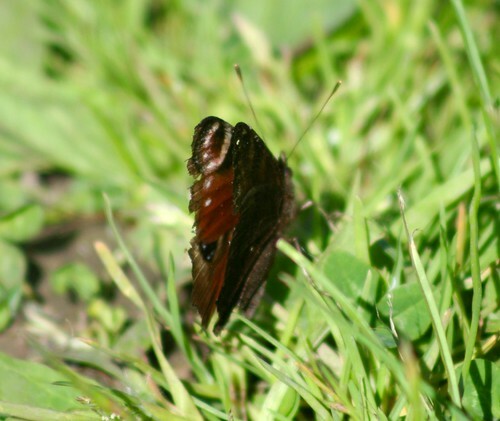 Oh admiral you flutter by teasing us, catching our eyes. You appear battered but I’m quite flattered that you took some time so I could create a rhyme just for you, even though you eat poo. Well the weekend was fabulous. Saturday morning my brother came over with his wife and kids. We all went to a pub for lunch and sat out in the shade and sunshine, alternating to warm up and cool down. I’ve kept pretty much covered up for the duration making sure I don’t get burned. This weekend has been sooooo very hot and lovely. As it was snowing just over a month ago it was slightly unexpected to have such great heat and nice weather over the weekend. I went with Becky and the kids to ToysRUs and Scotty went in to town with my brother to buy his suit for the wedding. The suit buying was a success but I’ve not been allowed to see it. BOO! I’ve seen the cufflinks and they were nice but I do know Scotty paid up around £750 for an entire outfit including shoes. I was quite shocked but at least he’s got some smart clothes now. I know he’s going to look very dapper on the day. Next I went with Becky and the kids to a party around the corner from my house. It was a 2-yr old birthday party but I felt very accepted even without kids of my own. It was my type of party with a huge tent in their back garden and everyone relaxing. It was odd seeing my house from a distance from someone Else’s garden. Most enjoyable. We’ve also been letting the cats out in the garden lots. After moving all the table and bbq away from the fence we are quite sure that they cannot get out easily and it is ok now to leave them to roam and chew their cat grass. Sunday was another beautiful day. I baked bread again, I’m enjoying this as a Sunday routine and it makes for great picnic lunches as long as I get up early enough to make it in time. I made pancakes for brunch too, it was the best and set us up for an afternoons walking. We took a ride out to Strumpshaw Fen run by the RSPB. We walked for a couple of hours following the trails, stopped off at a hide and relaxed in the breezy shade. There will be photos to follow on this one. It was a lovely walk. I feel thoroughly relaxed after this weekend and the only thing I could want is just more of it! I also had some time to finally get the invites together. around 80% are now fully addressed and all ready except postage stamps. I even printed labels with our address for envelopes I’ve placed inside to return to us. Then I realised, no directions. Most people can find dragon hall but, we’ve also not said where or what we want as presents etc. Scotty has said he will set up a web site with password access just for this, so mail me if you want the password, the web site will be: http://www.indifference-engine.com/wedding Except its not live yet. Its not been made yet but it will be.. oh yes watch this space. new beginnings… as guru says. Writing things down has helped. I’m amazed how much too. The thing is when I’m lost in self absorbed pity and hate its one thing after another attacking you internally, mentally and physically. The mental I’m sure some of you will understand the self doubt and irritation at how you are personally dealing with what is thrown at you. The physical is the pressure put upon yourself to not be like this and it makes it worse. Muscles tighten, the ability to calm down and take it all in fails and it leads to tension and headaches all stemming from my bad shoulders and being wound up like a spring. I’m my own worst enemy. There were two turning points last night. 1, My “guru” (read old friend) posted something to make me stop and think. Its what they do. Erudite comments at just the right moment to stop and make you take stock and realise what needs to be done. See here on new beginnings. One thing I know is to try not to get bogged down in what is called Maya, attachment to the physical being and frustrations there in. Its a difficult thing to do at the best of times but this reminder coupled with kripamoya’s elucidation on new beginnings I stopped in my tracks, wound myself down and started again. I tried my best to create a break point in my annoyances and relax and let it all go. 2, I re-read my post. I quite often do this and I’m really amazed at how much I leave up because I believe it is my heart felt comments on my situation. Its very self indulgent but it is needed to fully understand what is making me tick and learning how to accept myself. On re-read I started to understand why my concious thoughts were doing what they were doing. A constant irritation of several types is bound to wind you up. Lack of positive stimuli and the pile on of frustrations would make MOST people feel like that. I had every right to be all of those things I described so there was absolutely no point in telling myself to stop being so stupid. and then it stopped. I got home from work, sat out in the back garden and glued down a pile of wedding invites. Started writing out cards and putting them in envelopes. I was going to bring them to work today but I forgot, this does not bother me like lunch did yesterday. I got in some knit time which means the socks are still coming along even though they are behind, who cares when they are done, its too hot for socks now anyway. One small annoyance.. I got home to find the builders had moved some earth around and managed to dig up a nice trench along the boundary of my land. Now this would be ok if the house was built on enough land for me to get my car in and out of the garrage but it is not. They basically made sure I could not get my car out and parked the digger way too close. I had words with them this morning requesting certain things be done. If they are not I will be contacting them again this evening. They seemed nice enough about it. I chatted to mum about weddingy stuffs, now nothing is better than a good old yak with me ma. I love her and she’s still coping better than I would expect anyone to do with chemotherapy. This was therapeutic in itself. 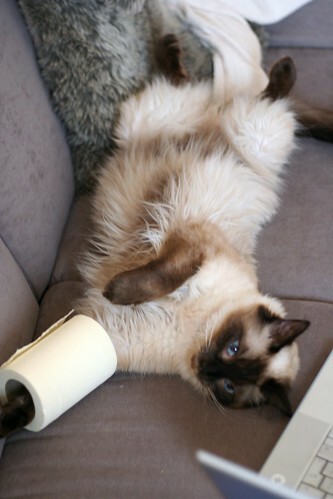 I saw this and although this Siamese is female, this was very much like the conversations we had with Erasmus. Alaska is very very special and I just wanted you all to know how very interactive having a cat is and how they can easily make it known what they want to do and you will not stop them. This is a fine example of the loveliness of pets. I never want to be without a pet. You are currently browsing the Jiva a soul in transit blog archives for May, 2008.